Today marks the beginning of my 11th year working on my own as a resume writer and career coach. I want to thank all of my clients, colleagues, and friends who have supported me. May I work at this job for many years. I love learning more about people's careers and helping them move forward. What Is the Best Website for a Job Search? There isn’t one. A good job search should never rely on one of anything. First, have more than one way to look for work: networking, identifying/following specific companies, job boards, LinkedIn, posting, recruiters, and temporary services. This list is not complete. There are many other ways to look for a job. My advice is that you should consistently use at least three methods during every job search. The same point applies to job boards. Many clients have told me that they love Indeed because it collects job posts from several websites. It does, and that has always been my problem with the site: the same job can be listed more than once. I recommend that job seekers find two or three sites they like to use and check for new posts every few days. Should you post a resume? In most cases, it doesn’t hurt. But it will seldom lead to an interview. When should you not post a resume? Never post a resume if your company has a history of firing employees who are looking for a job. Not many companies do this. However, I have been at two seminars where HR managers talked about working for companies that fired employees who were discovered to be looking for jobs. Posting should only be done if you are unemployed or if you are certain that it will not lead to your being fired. What sites do I recommend? Careerbuilder, Monster, and LinkedIn. If you are being paid by the hour or looking for a part-time job, Craigslist might be a good option. However, it’s also important to learn about any websites in your industry that might also post jobs. This could included sites for professional associations or industry news. Some groups on LinkedIn have job boards that are only open to members of the group. Keep looking for new sources where you can find potential employers. Don’t assume you are covering all the bases. Most important, never rely on one source. Good luck in your career management and job search in 2014 – Happy New Year! I have not posted in a couple of days because of computer problems. Regular posts should be available beginning tomorrow. Last week one of my clients showed me a job posting that he found interesting. It was for a managerial position with a broad range of responsibilities. My client is a hands-on type of person and wants a job where he wont’ be stuck behind a desk. There is only problem: pay. The job posting lists starting salary as $11-$13 per hour. To get a rough calculation of salary for an hourly position, follow this formula: wage multiplied by 2,000 (40 hour per week by 50 weeks per year). According to that model, the job my client is interested in only pays a maximum starting wage of $26,000. That’s ridiculous and shameful for a managerial position. However, it’s also what the way a smart, cheap company will hire employees. State the wage and find someone who’s desperate enough to take it. If you’re willing to take a job at a low wage, there will always be an employer who will happily pay that price. Know your worth and find an employer who will compensate you for the contribution you are making to the company. It’s not easy to find a job in the current economy. Even so, taking a bad job can often be a big step back. It’s hard to look for work when you’re working full time. It will also be hard to interview well if you’re working for a company that doesn’t respect you. Look for a way to generate income (part-time, contract work) while you find the job that pays. You owe yourself more than a bad job. One of my favorite Sunday morning activities is listening to Rick Kogan’s radio show on WGN. Kogan is a gravelly-voiced story-teller whose guests are in the Chicago arts and entertainment scene. Today he had two interesting gentlemen who are amateur historians with a particular focus on Bridgeport (the neighborhood that gave us both Daleys and several other mayors). Beyond the local interest, Rick and his guests pondered this great question: Why don’t more people care about history? It’s not that no one cares about history. Walk into any bookstore – the few that remain. History is still one of the largest sections. Many movies and TV shows are based on historical themes and characters. The problem is that most people don’t value history for its power in helping us understand who we are and what we can be. A big part of that problem is that we are obsessed with the future and trying to predict it. The presidential election offers a good model of this problem. Rather than look at the records of President Obama and Governor Romney, the press and pundits get lost in polls and the “what will happen” question. One of my former bosses had a great saying, “Nothing predicts behavior like behavior.” History is our record of behavior, what a person has done, and what the consequences of those actions were. The problem is that it’s hard to think about history. It’s easier to speculate on the “could” and “might” of the future. History also suffers because we read less and less. Bookstores and newspapers are closing because more Americans are turning to the short form news sources of the Internet and TV. Don’t get me wrong. Those media can be excellent vehicles to learn history. I love the Civil War, and Ken Burns’ TV series helped spark my interest. Similarly, the Library of Congress’ website brings resources to people across the globe. However, few people access those sources or use them to shape their opinions. We also read paragraphs and headlines rather than books. Our knowledge of history is becoming more and more fit to a game of Trivial Pursuit, which reaches the point of absurdity in Jay Leno’s “Jaywalking” segments. The final point that I think has diminished the power of history is our culture’s failure to think critically. Too often, we choose a political or ideological position and cling to it with full faith. We pluck facts to support that belief and ignore those that go against our way of thinking. Real history (not to be confused with propaganda) is a warts and all proposition. FDR may be the greatest American president of all time. However, he also interned Japanese American citizens and failed to act against Hitler’s genocide. Those are facts. Just as it is a fact that Ronald Reagan raised taxes (several times) and gave amnesty to undocumented immigrants. Why is this a problem? It could be argued that people will seek the knowledge they need, which would mean history, like geography, is just another topic we no longer study or care about. One of my friends, some I greatly respect as a thinker, says that it doesn’t matter what people study as long as they learn to be smart, critical thinkers. While I value critical thinking, I also believe it is vital for people to have some common way of understanding the past. We also need to look to the past as a teacher, not a model that we need to rebuild, but a guide that will help us make decisions about how we want to live now and in the future. I don’t have a solution to this problem. A society that watches “reality” TV is not going to devote the time needed to read David Herbert Donald’s 500 page biography of Lincoln or Jacques Barzun’s study of Western civilization. Most people don’t have the time or focus to read or ask critical questions. We work long hours, and it’s a relief to turn on the tube and laugh when Jay asks, “Who wrote the Declaration of Independence?” and a college graduate shrugs his shoulders and answers, “Abraham Lincoln.” We laugh because we cannot look in the mirror. It’s too painful. On Thom Hartmann’s Big Picture, the author Naomi Klein talked about the power she felt being among the protesters camped near Wall Street. She described one man who was carrying a sign with these words: “I lost my job and found an occupation.” The play on words is significant in more ways than one. Pundits, including former President Clinton, keep asking what this group wants, what it stands for. What the wise ones can’t understand is that some actions speak a language that belies simplicity. The word occupy is not easily defined. In one sense, it holds the definition of taking something, best seen in a military occupation. In another, the occupant lives in a place – to occupy is to be at home. The definition I find most interesting, however, is occupation as engagement: What occupies you thoughts? The protesters in New York, and their supporters across the U.S. and several other countries, are engaging a culture that is stuck in a rut. Rather than try to provide a simple answer (think 9-9-9 or “Drill, baby, drill” or “Change”), they are opening a space where questions are possible. What’s next? Who knows? Yesterday, the process spread to cities in other countries. There was a riot in Rome, which the corporate-owned media took great pleasure in reporting. But, as this post in the Daily Kos indicates, the crowds that marched in Time Square, America’s blaring shrine to the media, indicate that this movement – whatever it is – is growing. People want to engage in the process. They want to occupy the space our leaders have abandoned in their weakness, greed, and small-mindedness. My lens for understanding this phenomenon is Wallace Stevens’ poem Thirteen Ways of Looking at a Blackbird. When I first read this poem as an undergraduate, it struck me as nonsense. But, as I wrestled with it – and with Stevens – it became clear that sometimes it’s about not being clear. We constantly experience complex, beautiful phenomena. But our practical world, our Ben Franklin common sense, makes us segregate and simplify. Reality is all about how we look at something. The media wants a simple story that can be told in a few seconds (leaving more time for commercials). Occupy Wall Street hasn’t given in to such simplicity. Neither did the people who occupied Tahrir Square in Egypt and those who camped in the streets of Tel Aviv, the protestors who have marched in Greece, Britain, and the brave souls in Syria who remain strong in the face of bullets. What do we see? How do we see? Of one of many circles." We don’t see the full of reality, just the “edge of one of many circles.” We try to make sense of a reality that is moving around us like a black bird flying in the snow. The protest movements crisscrossing the world are about a different way of seeing. Will they change the way we live? Naomi Klein and John Nichols speculate on the meaning of Occupy Wall Street. About a week ago I took my first trip to Las Vegas. Friends said it would be like nothing I had seen before, and they were right. The strip, especially at night, is Disneyland for adults. People flow from casino to casino. Some are going to shows, and some are going to restaurants. The heart of the city, however, beats with the slot machines and gaming tables. This aspect of Las Vegas reflects post-Reagan America, a country that welcomes risks and says losers be damned. We know the house wins, but we play the game anyway. The person playing next to you is not your problem. Win or lose – you are alone. My friends and I visited another aspect of the country when we went to Hoover Dam. We took a tour of the facility, which was interesting in several ways. 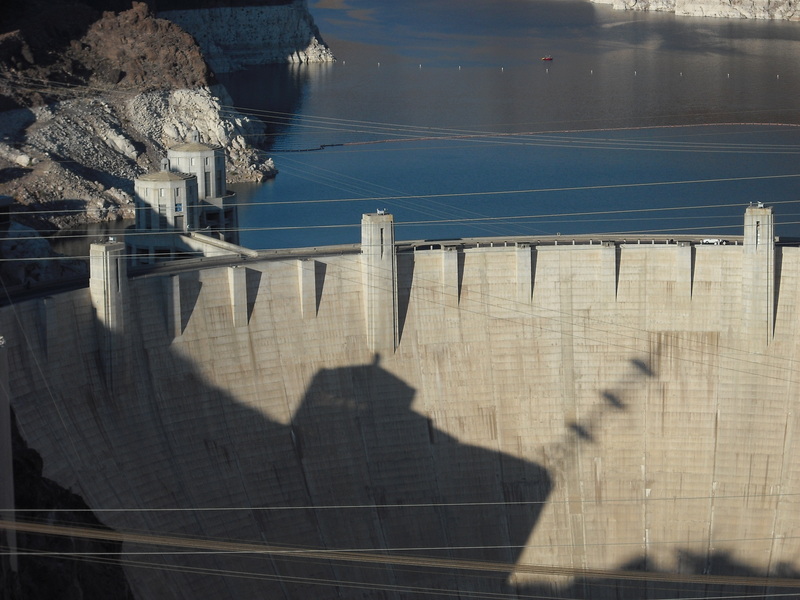 The Dam is an engineering wonder, which was completed during the Great Depression. It represents the opposite of the strip: control, security, and shared resources. The water that the Dam holds in Lake Mead is not only used by Las Vegas. Its primary function is irrigation for farms in Southern California that are essential to the nation’s food supply. Before the Dam was built, the Colorado River would often flood and ruin crops. 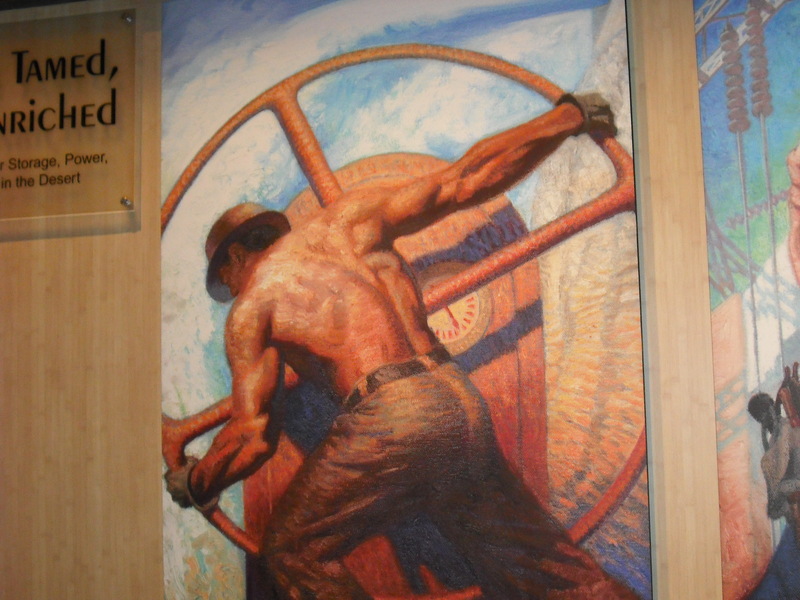 For me the Dam represents a country that builds for the future, a shared future. 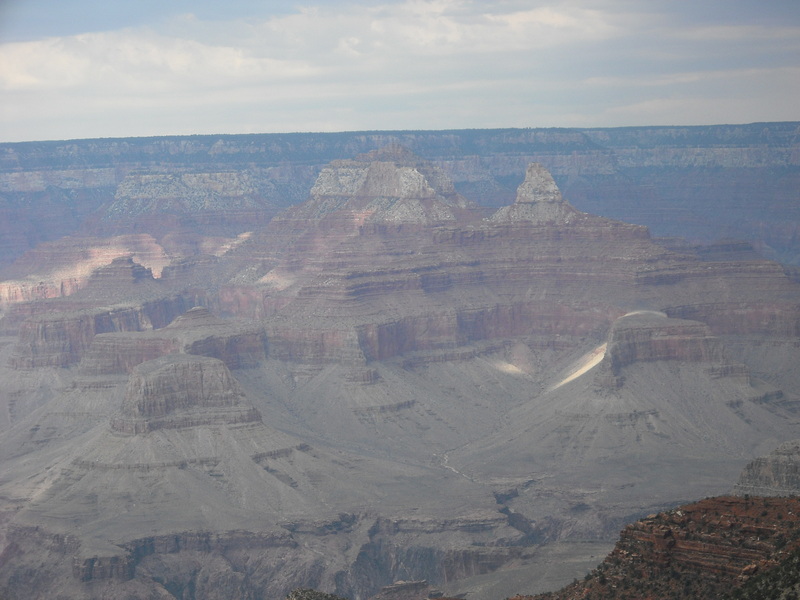 We also took a tour to see the Grand Canyon. This version of America puts everything in perspective: man is small and pitiful in the face of nature. We can build skyscrapers and rockets that go to the moon. We could never do what nature has done in carving this wonder. This is the America that is too often being lost to our need to build and grow. In Kentucky and West Virginia, smaller wonders have been spoiled in the process called mountain top removal. In Alaska and the Gulf of Mexico, we have fouled the oceans with oil spills. Thank god developers have found nothing of value in the Grand Canyon. . . yet. I came away from Las Vegas with both fear and hope. My fear is that we are becoming a nation of risk takers who care little about our fellow citizens or the future. Gambling, which was once legal only in a few places, is now a national growth industry. 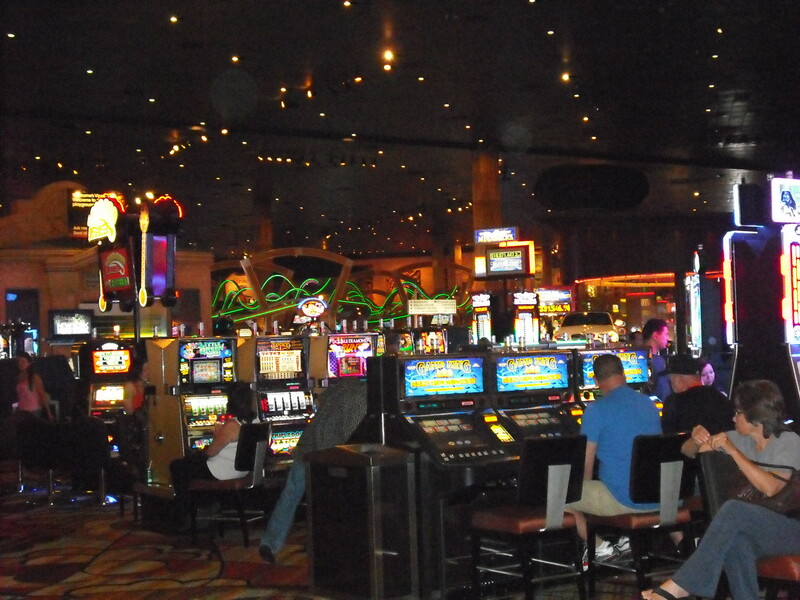 Governors and mayors cry poor and look to casinos as alternatives to increased taxes. I see people who are obviously not wealthy buy $10 or $20 of lottery tickets, their hope for the future. This is the America where risk rules and the winners run the game. Still, I also came away from my trip to Las Vegas with some hope. If we can build Hoover Dam during the greatest financial crisis in the country’s history, we can wake up again and work together for the common good. 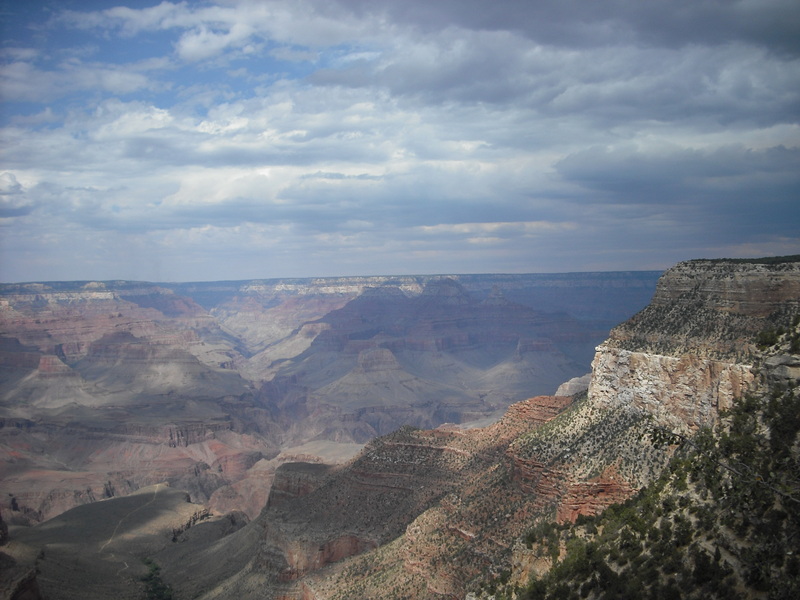 We still have the Grand Canyon to inspire us to protect the planet and its wonders. We still have a chance – if we don’t gamble it away. 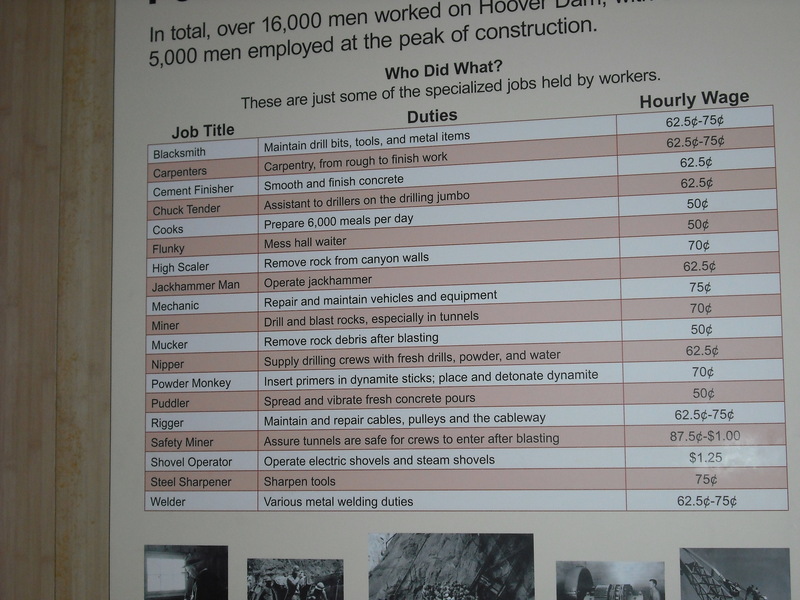 Wages of workers at the Dam.